Treat your Mum to a perfect Mother’s Day treat, with a delicious and traditional three course Mother’s Day Lunch at The Bedford Hotel in the heart of Tavistock. The finest seasonal Devon produce, prepared with care and presented with flair, in the warm and welcoming surroundings of The Bedford. Relax – make a day of it – and take a stroll through The Meadows after lunch. Or simply enjoy a lazy afternoon together, in our comfortable lounges. 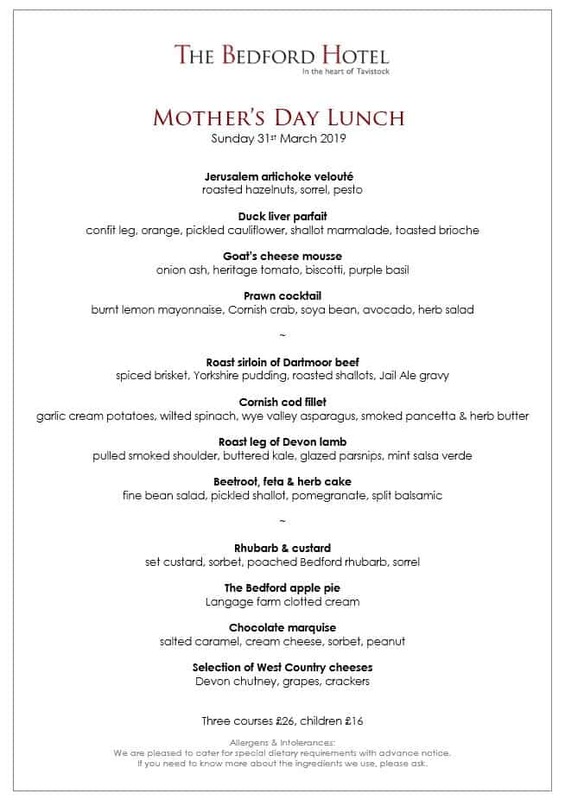 Three course Mother’s Day Lunch served from 12 noon until 2pm. Adults £26, children £16. Call 01822-613221 to book your table, or book on-line. We will request a non-refundable deposit of £10 per person to confirm your booking. We are also serving Mother’s Day Lunch at our sister hotel, the Two Bridges Hotel on Dartmoor, or for something a little different book an indulgent Mother’s Day Sparkling Afternoon Tea served from 3pm until 5pm.